The gaming industry’s shift from disk to digital presents many unique challenges and opportunities. Digital gaming makes it easier than ever to get games into the hands of more players, in more places, more quickly. But, in order to take full advantage of this channel, companies need to overcome the challenges of the Internet. 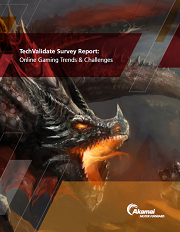 To find out more about the trends and challenges that online gaming companies are facing, download this exclusive survey report.